ADAMS, John Quincy, sixth president of the United States under the constitution, born in Braintree, Massachusetts, 11 July 1767; died in Washington, District of Columbia, 23 February 1848. He was named for his mother's grandfather, John Quincy. In his eleventh year he accompanied his father to France, and was sent to school near Paris, where his proficiency in the French language and other studies soon became conspicuous. In the following year he returned to America, and back again to France with his father, whom, in August 1780, he accompanied to Holland. After a few months at school in Amsterdam, he entered the University of Leyden. Two years afterward John Adams's secretary of legation, Francis Dana, was appointed minister to Russia, and the boy accompanied him as private secretary. After a stay of fourteen months, as Catharine's government refused to recognize Mr. Dana as minister, young Adams left St. Petersburg and traveled alone through Sweden, Denmark, and northern Germany to France, spending six months in the journey. Arriving in Paris, he found his father busy with the negotiation of the treaty of peace between Great Britain and the United States, and was immediately set to work as secretary, and aided in drafting the papers that " dispersed all possible doubt of the independence of his country." In 1785, when his father was appointed minister to England, he decided not to stay with him in London, but to return at once to Massachusetts in order to complete his education at Harvard College. For an American career he believed an American education to be best fitted. Considering the immediate sacrifice of pleasure involved, it was a remarkably wise decision in a lad of eighteen. But Adams's character was already fully formed; he was what he remained throughout his life, a Puritan of the sternest and most uncompromising sort, who seemed to take a grim enjoyment in the performance of duty, especially when disagreeable. Returning home, he was graduated at Harvard College in 1788, and then studied law in the office of Theophilus Parsons, afterward chief justice of Massachusetts. In 1791 he was admitted to the Suffolk bar, and began the practice of law, the tedium of which he relieved by writing occasional articles for the papers. Under the signature of"Publicola" he criticized some positions taken by Thomas Paine in his " Rights of Man ": and these articles, when republished in England, were generally attributed to his father. In a further series of papers, signed " Marcellus," he defended Washington's policy of neutrality; and in a third series, signed "Columbus," he discussed the extraordinary behavior of Citizen Genet, whom the Jacobins had sent over to browbeat the Americans into joining France in hurling defiance at the world. These writings made him so conspicuous that in 1794 Washington appointed him minister to Holland, and two years later made an appointment transferring him to Portugal. Before he had started for the latter country his father became president of the United States and asked Washington's advice as to the propriety of promoting his own son by sending him to Berlin. Washington in strong terms recommended the promotion, declaring that in his opinion the young man would prove to be the ablest diplomat in the American service. 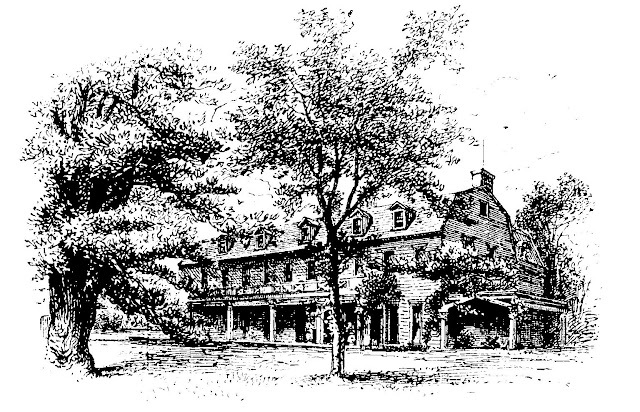 In the fall of 1797 Mr. Adams accordingly took up his residence at the capital of Prussia. Shortly before this he had married Miss Louisa Johnson, a niece of Thomas Johnson, of Maryland. During his residence at Berlin Mr. Adams translated Wieland's "Oberon" into English. In 1798 he was commissioned to make a commercial treaty with Sweden. In 1800 he made a journey through Silesia, and wrote an account of it, which was published in London and afterward translated into German and French. When Jefferson became president, Mr. Adams's mission terminated. He resumed the practice of law in Boston, but in 1802, was elected to the Massachusetts senate, and next year was chosen to the senate of the United States instead of Timothy Pickering. The Federalist Party was then entwined by the feud between the partisans of John Adams and those of Hamilton, and the reception of the younger Adams in the senate was far from flattering. Affairs grew worse when, at the next vacancy, Pickering was chosen to be his uncongenial colleague. Mr. Adams was grossly and repeatedly insulted. Any motion he might make was sure to be rejected by the combined votes of republicans and Hamiltonians, though frequently a large majority would carry the same motion, made soon afterward by somebody else. A committee of which he was a member would make and send in its report without even notifying him of its time and place of meeting. At first Mr. Adams was subjected to such treatment merely because he was the son of his father; but presently he rendered himself more and more amenable to it by manifesting the same independence of party ties that had made his father so unpopular. Independence in politics has always been characteristic of the Adams family, and in none has this been more strongly marked than in John Quincy Adams. His first serious difference with the Federalist Party was occasioned by his qualified approval of Jefferson's purchase of Louisiana, a measure that was bitterly opposed and fiercely censured by nearly all the federalists, because it was feared it would add too much strength to the south. A much more serious difference arose somewhat later, on the question of the embargo. Questions of foreign rather than of domestic policy then furnished the burning subjects of contention in the United States. Our neutral commerce on the high seas, which had risen to very considerable proportions, was plundered in turn by England and by France, until its very existence was threatened. In May 1806, the British government declared the northern coast of Europe, from Brest to the mouth of the Elbe, to be blockaded. By the Russian proclamation of 1780, which was then accepted by all civilized nations except Great Britain, such paper blockades were illegal; but British ships nonetheless seized and confiscated American vessels bound to any port on that coast. In November Napoleon issued his Berlin decree making a paper blockade of the whole British coast, whereupon French cruisers began seizing and confiscating American vessels on their way from British to French ports. Two months later England issued an order in council, forbidding neutrals to trade between any of her enemy's ports; and this was followed by orders decreeing fines or confiscation to all neutral ships daring to violate the edict. In December 1807, Napoleon replied with the Milan decree, threatening to confiscate all ships bound to England, or which should have paid a fine to the British government or submitted to search at the hands of a British commander. All these decrees and orders were in flagrant violation of international law, and for a time they made the ocean a pandemonium of robbery and murder. Their effect upon American commerce was about the same as if both England and France had declared war against the United States. Their natural and proper effect upon the American people would have been seen in an immediate declaration of war against both England and France, save that our military weakness was then too manifest to make such a course anything but ridiculous. Between the animus of the two bullies by whom we were thus tormented there was little to choose; but in two respects England's capacity for injuring us was the greater. In the first place, she had more ships engaged in this highway robbery than France, and stronger ones; in the second place, owing to the difficulty of distinguishing between Americans and Englishmen, she was able to add the crowning wickedness of kidnapping American seamen. The wrath of the Americans was thus turned more against England than against France; and never perhaps in the revolutionary war had it waxed stronger than in the summer of 1807, when, in full sight of the American coast, the "Leopard" fired upon the "Chesapeake," killed and wounded several of her crew, and violently carried away four of them. For this outrage the commander of the "Leopard" was promoted in the British service. In spite of all these things, the hatred of the federalists for France was so great that they were ready to put up with insult added to injury rather than attack the power that was warring against Napoleon. So far did these feelings carry them that Mr. John Lowell, a prominent federalist of Boston, was actually heard to defend the action of the Leopard." Such pusillanimity incensed Mr. Adams. "This was the cause," he afterward said,"which alienated me from that day and forever from the councils of the federal party." He tried to persuade the federalists of Boston to hold a meeting and pledge their support to the government in any measures, however serious, that it might see fit to adopt in order to curb the insolence of Great Britain. But these gentlemen were too far blinded by party feeling to respond to the call whereupon Mr. Adams attended a republican meeting, at which he was put upon a committee to draft and report such resolutions. Presently the federalists bowed to the storm of popular feeling and held their meeting, at which Mr. Adams was also present and drafted resolutions. For his share in the proceedings of the republicans it was threatened that he should"have his head taken off for apostasy." It was never of much use to threaten Mr. Adams. An extra session of congress was called in October to consider what was to be done. Mr. Jefferson's government was averse to war, for which the country was ill prepared, and it was thought that somewhat milder measures might harass England until she would submit to reason. 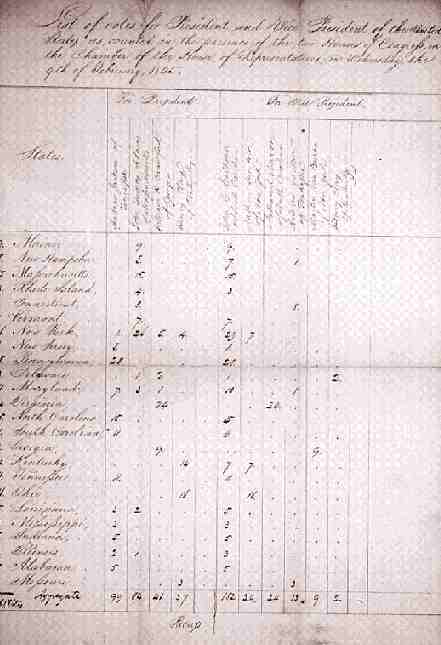 For a year and a half a non-importation act had been in force; but it had proved no more effective than the non-importation agreements of 1768 and 1774. Now an embargo was laid upon all the shipping in American ports. The advantage of such a measure was very doubtful; it was damaging us in the hope of damaging the enemy. The greatest damage fell upon the maritime states of New England, and there the vials of federalist wrath were poured forth with terrible fury upon Mr. Jefferson and the embargo. But the full measure of their ferocity was reserved for Mr. Adams, who had actually been a member of the committee that reported the bill, and had given it his most earnest support. All the choicest epithets of abuse were showered upon him; few men in our history have been more fiercely berated and reviled. His term of service in the senate was to expire on 3 March 1809. In the preceding June the Massachusetts legislature chose Mr. Lloyd to succeed him, a proceeding that was intended and accepted as an insult. Mr. Adams instantly resigned, and Mr. Lloyd was chosen to fill the remainder of his term. In the course of the next month the republicans of his congressional district wished to elect him to the House of Representatives, but he refused. In 1806 Mr. Adams had been appointed professor of rhetoric and belles lettres at Harvard College, and in the intervals of his public duties had delivered lectures there, which were published in 1810, and for a time were held in esteem. One of Mr. Madison's first acts on succeeding to the presidency in 1809 was to nominate Mr. Adams minister to Russia. Since Mr. Dana's failure to secure recognition in 1782, the United States had had no minister in that country, and the new mission was now to be created. 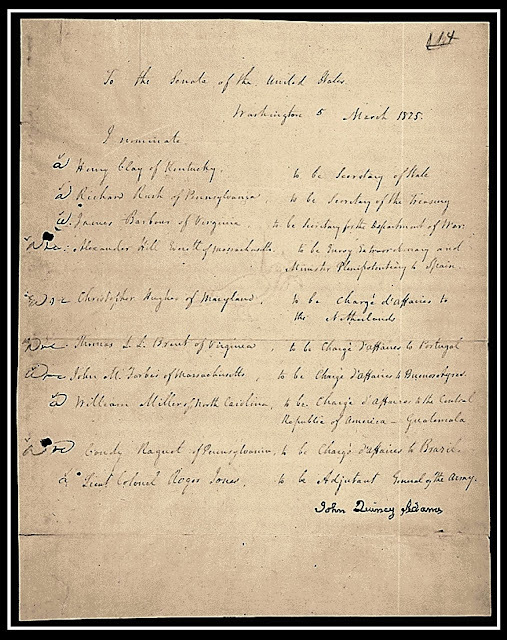 The senate at first declined to concur in creating the mission, but a few months later the objectors yielded, and Mr. Adams's nomination was confirmed. Alexander I very courteously received him, and his four years and a half in Russia passed very pleasantly. His diary gives us a vivid account of the Napoleonic invasion and its disastrous ending. In the autumn of 1812 the czar offered his services as mediator between the United States and Great Britain. War had only been declared between these powers three months before, but the American government promptly accepted the proposal, and, in the height of the popular enthusiasm over the naval victories of Hull and Decatur, sent Messrs. Gallatin and Bayard to St. Petersburg to act as commissioners with Mr. Adams. The British government refused to accept the mediation of Russia, but proposed instead an independent negotiation, to which the United States agreed, and the commissioners were directed to meet at Ghent. Much time was consumed in these arrangements, while we were defeating England again and again on the sea, and suffering in return some humiliating reverses on land, until at last the commissioners met at Ghent, in August 1814. Henry Clay and Jonathan Russell were added to the American commission, while Lord Gambier, Dr. Adams, and Mr. Goulburn represented England. After four months of bitter wrangling, from which no good result could have been expected, terms of peace were suddenly agreed upon in December. In warding off the British attempts to limit our rights in the fisheries Mr. Adams played an important part, as his father had done in 1782. The war had been a drawn game, neither side was decisively victorious, and the treaty apparently left things much as before. Nothing was explicitly done to end the pretensions of England to the right of search and the impressments of seamen, yet the naval victories of the United States had taught the British a lesson, and these pretensions were never renewed. The treaty was a great disappointment to the British people, who had hoped to obtain some advantages, and Mr. Adams, for his share in it, was reviled by the London press in a tone, which could not but be regarded as a compliment to his powers. After the conclusion of the treaty he visited Paris and witnessed the return of Napoleon from Elba and the exciting events that followed up to the eve of Waterloo. Here his wife and children joined him, after a tedious journey from St. Petersburg, not without distress and peril by the way. By this time Mr. Adams had been appointed commissioner, with Clay and Gallatin, to negotiate a new commercial treaty with England. This treaty was completed on 13 July 1815; but already, on 26 May when Mr. Adams arrived in London, he had received the news of his appointment as minister to England. The series of double coincidences in the Adams family between missions to England and treaties with that power is curious. First John Adams is minister, just after his share in the treaty that concluded the revolutionary war, then his son, just after the treaty that concluded the war of 1812-'15, and then the grandson is minister during the civil war and afterward takes part in the treaty that disposed of the Alabama question. After an absence of eight years, John Quincy Adams was called back to his native land to serve as secretary of state under President Monroe. A new era in American politics was dawning. 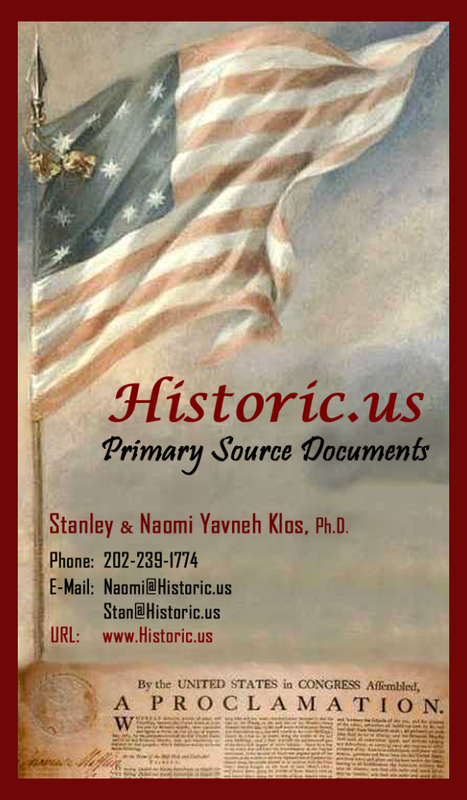 The war, which had just been concluded, has sometimes been called our second war of independence; certainly the year 1815, which saw the end of the long strife between France and England, marks an important era in American history. Our politics ceased to be concerned mainly with foreign affairs. So suddenly were men's bones of political contention taken away from them that Monroe's presidency is traditionally remembered as the "era of good feeling." So far as political parties were concerned, such an epithet is well applied; but as between prominent individuals struggling covertly to supplant one another, it was anything rather than an era of good feeling. Mr. Adams's principal achievement as secretary of state was the treaty with Spain, whereby Florida was ceded to the United States in consideration of $5,000,000, to be applied to the liquidation of outstanding claims of American merchants against Spain. The same treaty established the boundary between Louisiana and Mexico as running along the Sabine and Red rivers, the upper Arkansas, the crest of the Rocky Mountains, and the 42d parallel. Mr. Adams defended the conduct of General Jackson in invading Spanish Florida and hanging Arbuthnot and Ambrister. The Adams-Onís Treaty was negotiated in response to Andrew Jackson’s incursion into Florida to stop the raids of the Seminole Indians on U.S. settlements along the border. Signed on February 22, 1819, and ratified by the United States in 1821, the treaty granted to the United States Florida and former Spanish territory west of the Sabine River, along a new boundary line north of Texas, New Mexico, Utah, Nevada, and California. He supported the policy of recognizing the independence of the revolted colonies of Spanish America, and he was the principal author of what is known as the "Monroe Doctrine," that the American continent is no longer open to colonization by European powers. His official report on weights and measures showed remarkable scientific knowledge. Toward the close of Monroe's first term came up the first great political question growing out of the purchase of Louisiana: Should Missouri be admitted to the union as a slave-state, and should slavery be allowed or prohibited in the vast territory beyond? After the Missouri compromise had passed through congress, and been submitted to President Monroe for his signature, two questions were laid before the cabinet. First, had congress the constitutional right to prohibit slavery in a territory and, secondly, in prohibiting slavery "forever" in the territory north of Mason and Dixon's line, as prolonged beyond the Mississippi river, did the Missouri bill refer to this district only so long as it should remain under territorial government, or did it apply to such states as might in future be formed from it? To the first question the cabinet replied unanimously in the affirmative. To the second question Mr. Adams replied that the term "forever" really meant forever; but all his colleagues replied that it only meant so long as the district in question should remain under territorial government. Here for the first time we see Mr. Adams taking that firm stand in opposition to slavery, which hereafter was to make him so famous. Mr. Monroe's second term of office had scarcely begun when the question of the succession came into the foreground. The candidates were John Quincy Adams, secretary of state; William H. Crawford, secretary of the treasury; John C. Calhoun, secretary of war; and Henry Clay, speaker of the House of Representatives. Shortly before the election General Jackson's strength began to loom up as more formidable than the other competitors had supposed. Jackson was then at the height of his popularity as a military hero, Crawford was the most dexterous political manager in the country. Clay was perhaps the most persuasive orator. Far superior to these three in intelligence and character, Mr. Adams was in no sense a popular favorite. His manners were stiff and disagreeable; he told the truth bluntly, whether it hurt or not; and he never took pains to conciliate any one. The best of men in his domestic circle, outside of it he had few warm friends, but he seemed to have a talent for making enemies. When Edward Everett asked him if he was "determined to do nothing with a view to promote his future election to the presidency as the successor of Mr. Monroe," he replied that he "should do absolutely nothing," and from this resolution he never swerved. He desired the presidency as much as any one who was ever chosen to that high office; but his nature was such that unless it should come to him without scheming of his own, and as the unsolicited expression of popular trust in him, all its value would be lost. Under the circumstances, it was a remarkable evidence of the respect felt for his lofty character and distinguished services that he should have obtained the presidency at all. The result of the election showed 99 votes for Jackson. 84 for Adams, 41 for Crawford, 37 for Clay. Mr. Calhoun, who had withdrawn from the contest for the presidency, received 182 votes for the vice-presidency, and was elected. The choice of the president was thrown into the House of Representatives, and Mr. Clay now used his great influence in favor of Mr. Adams, who was forthwith elected. When Adams afterward made Clay his secretary of state, the disappointed partisans of Jackson pretended that there had been a bargain between the two, that Adams had secured Clay's assistance by promising him the first place in the cabinet, and thus, according to a usage that seemed to be establishing itself, placing him in the line of succession for the next presidency. The peppery John Randolph characterized this supposed bargain as "a coalition between Blifil and Black George, the Puritan and the blackleg." There never was a particle of foundation for this reckless charge, and it has long since been disproved. During Monroe's administration the Federalist Party had become extinct. In the course of John Quincy Adams's administration the new division of parties into Whigs and Democrats began to grow up, the Whigs favoring internal improvements, the national bank, and a high tariff on importations, while the Democrats opposed all such measures on the ground that they were incompatible with a strict construction of the constitution. In its relation to such questions Mr. Adams's administration was Whig, and thus arrayed against itself not only all the southern planters, but also the ship-owners of New England and the importers of New York. But a new and powerful tendency now came in to overwhelm such an administration as that of Adams. The so-called "spoils system" was already germinating, and the time had come when it could be put into operation. Mr. Adams would have nothing to say to such a system. He would not reward the men who worked for him, and he would not remove from office the men who most vigorously opposed him. He stood on his merits, asked no favors and granted none; and was, on the whole, the most independent president we have had since Washington. Jackson and his friends promised their supporters a share in the government offices, in which a"clean sweep " was to be made by turning out the present incumbents. The result of the election of 1828 showed that for the time Jackson's method was altogether the more potent since he obtained 178 electoral votes, against 83 for Adams. The close of his career as president was marked by an incident that increased the odium in which Mr. Adams was held by so many of the old federalist families of Boston. In the excitement of the election the newspapers devoted to Jackson swarmed with mischievous paragraphs designed to injure Adams's reputation. Among other things it was said that, in 1808, he had suspected some of the federalist leaders of entertaining a scheme for carrying New England out of the union, and, fearing that such a scheme would be promoted by hatred of the embargo, and that in case of its success the seceded states would almost inevitably be driven into alliance with Great Britain, he communicated his suspicions to President Jefferson and other leading republicans. These tales, published by unscrupulous newspapers twenty years after the event, grossly distorted what Mr. Adams had actually said and done; and thirteen eminent Massachusetts federalists addressed to him an open letter, demanding that he should bring in a bill of particulars supported by evidence. Adams replied by stating the substance of what he had really said, but declining to mention names or to point out the circumstances upon which his suspicion had been based. In preserving this reticence he was actuated mainly by unwillingness to stir up a furious controversy under circumstances in which it could do no good. But his adversaries made the mistake of attributing his forbearance to dread of ill consequences to himself, a motive by which, it is safe to say, Mr. Adams was never influenced on any occasion whatever. So the thirteen gentlemen returned to the attack. Mr. Adams then wrote out a full statement of the case, completely vindicating himself, and bringing forward more than enough evidence to justify any such suspicions as he had entertained and guardedly stated. After finishing this pamphlet he concluded not to publish it, but left it among his papers. 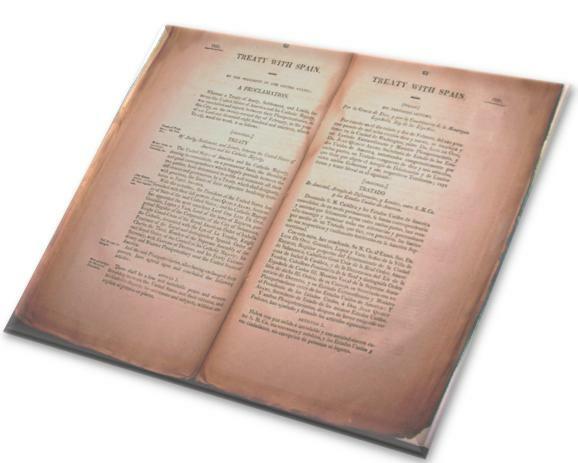 It has lately been published by Professor Henry Adams, in his "Documents relating to New England Federalism," and is not only of great historical importance, but is one of the finest specimens of political writing to be found in the English language. Although now an ex-president, Mr. Adams did not long remain in private life. The greatest part of his career still lay before him. Owing to the mysterious disappearance of William Morgan, who had betrayed some of the secrets of the Masonic order, there was in some of the northern states a sudden and violent prejudice against the Freemasons and secret societies in general. An "anti-mason party" was formed, and by its votes Mr. Adams was, in 1831, elected to congress, where he remained, representing the same district of Massachusetts, until his death in 1848. He was shortly afterward nominated by the anti-masons for the governorship of Massachusetts, but was defeated in the legislature, there being no choice by the people. In congress he occupied a perfectly independent attitude. He was one of those who opposed President Jackson's high-handed treatment of the bank, but he supported the president, in his firm attitude toward the South Carolina nullifiers and toward France. In 1835, as the French government delayed in paying over the indemnity of $5,000,000 which had been agreed upon by the treaty of 1831 for plunder of American shipping in the Napoleonic wars, Jackson threatened, in ease payment should be any longer deferred, to issue letters of marquee and reprisal against French commerce. This bold policy, which was successful in obtaining the money, enlisted Mr. Adams's hearty support. He defended Jackson as he had defended Jefferson on the occasion of the embargo; and this time, as before, his course was disapproved in Massachusetts, and he lost a seat in the United States senate. He had been chosen to that office by the state senate, but the lower house did not concur, and before the question was decided the news of his speech in favor of reprisals turned his supporters against him. He was thus left in the House of Representatives more independent of party ties than ever, and was accordingly enabled to devote his energies to the aid of the abolitionists, who were now beginning to appear conspicuously upon the scene. At that time it was impossible for the opponents of slavery to affect much. The only way in which they could get their case before congress was by presenting petitions for the abolition of slavery in the District of Columbia. Unwilling to receive such petitions, or to allow any discussion on the dreaded question, congress in 1836 enacted the cowardly "gag rule," that "all petitions, memorials, resolutions, or papers relating in any way or to any extent whatsoever to the subject of slavery or the abolition of slavery, shall, without being either printed or referred, be laid upon the table; and that no further action whatever shall be had thereon." After the yeas and nays had been ordered on this, when Mr. Adams's name was called he rose and said: "I hold the resolution to be a direct violation of the constitution of the United States, the rules of this house, and the rights of my constituents." The house sought to drown his words with loud shrieks and yells of "Order ! .... Order!" but he raised his voice to a shout and defiantly finished his sentence. The rule was adopted by a vote of 117 to 68, but it did more harm than good to the pro-slavery party. They had put themselves in an untenable position, and furnished Mr. Adams with a powerful weapon, which he used against them without mercy. As a parliamentary debater he has had few if any superiors; in knowledge and dexterity there was no one in the house who could be compared with him; he was always master of himself, even at the white heat of anger to which he often rose; he was terrible in invective, matchless at repartee, and insensible to fear. A single-handed fight against all the slaveholders in the house was something upon which he was always ready to enter, and he usually came off with the last word. Though the vituperative vocabulary of the English language seemed inadequate to express the hatred and loathing with which the pro-slavery party regarded him, though he was more than once threatened with assassination, nevertheless his dauntless bearing and boundless resources compelled the respect of his bitterest opponents, and members from the south, with true chivalry, sometimes confessed it. Every session he returned to the assault upon the gag-rule, until the disgraceful measure was rescinded in 1845. This part of Mr. Adams's career consisted of a vast number of small incidents, which make a very interesting and instructive chapter in American history, but cannot well be epitomized. He came to serve as the rallying point in congress for the ever-growing anti-slavery sentiment, and may be regarded, in a certain sense, as the first founder of the new Republican Party. He seems to have been the first to enunciate the doctrine upon which Mr. Lincoln afterward rested his great proclamation of emancipation. In a speech in congress in 1836 he said: "From the instant that your slave-holding states become the theatre of war*civil, servile, or foreign from that instant the war powers of the constitution extend to interference with the institution of slavery in every way in which it can be interfered with." As this principle was attacked by the southern members, Mr. Adams from time to time reiterated it, especially in his speech of 14 April 1842, on the question of war with England and Mexico, when he said: "Whether the war be civil, servile, or foreign, I lay this down as the law of nations: I say that the military authority takes for the time the place of all municipal institutions, slavery among the rest. Under that state of things, so far from its being true that the states where slavery exists have the exclusive management of the subject, not only the president of the United States, but the commander of the army has power to order the universal emancipation of the slaves." After the rescinding of the gag-rule Mr. Adams spoke less frequently. In November 1846, he had a shock of paralysis, which kept him at home four months. On 21 February 1848, while he was sitting in the House of Representatives, came the second shock. He was carried into the speaker's room, where he lay two days, and died on the 23d. His last words were: "This is the last of earth; I am content." See "Life and Public Services of John Quincy Adams," by William H. Seward (Auburn, 1849) "Life of John Quincy Adams," by Josiah Quincy (Boston, 1858);" Diary of John Quincy Adams," edited by Charles F. Adams, 12 vols., 8vo (Philadelphia, 1874-'7); and "John Quincy Adams," by John T. Morse, Jr. (Boston, 1882). The steel portrait of Mr. Adams, facing page 24, is from a picture by Marchant, in the possession of the New York Historical Society. The mansion represented on page 26 is the Adams homestead at Quincy, in which the presidents lived, now the summer residence of Charles Francis Adams. 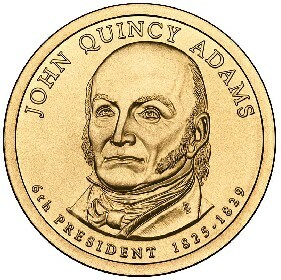 John Quincy Adams, was born in Braintree (now Quincy), Massachusetts, on July 11, 1767, the first son of the brilliant, patriotic, and strong-willed Abigail Smith Adams and her husband, John Adams, then a little-known country lawyer who later became the second President of the United States. John Quincy was a child of American independence, the primary architect of the first century of the nation's foreign policy, and an implacable foe of slavery. He became the sixth President of the United States. 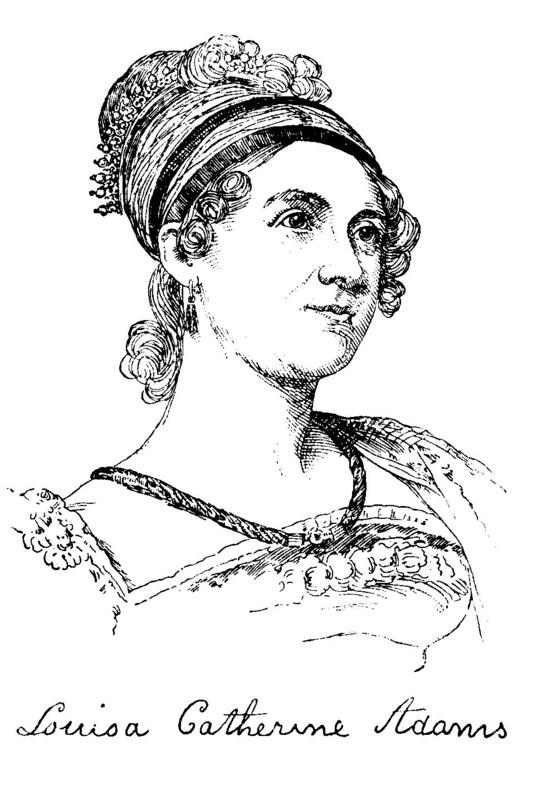 During a mission to London in 1796-97 he married Louisa Catherine Johnson, the daughter of a Maryland merchant serving as U.S. consul in London. Their marriage produced three children and lasted until his death 51 years later. John Quincy Adams began 70 years of public service when in 1778, at the age of 11 he acted as his father's secretary during a diplomatic mission to France. Adams lived in The Hague, London, and Paris, where he pursued his formal education. When he came back to America in 1785 to enter Harvard College, he knew five or six modern languages as well as Latin and Greek. Adams graduated from Harvard in 1787 and two years later finished his legal apprenticeship. Without enthusiasm he began to practice law in Boston in 1790. He was soon easily distracted into writing a notable series of newspaper articles, the “Publicola” essays. These essays attacked the ideas of Thomas Paine's The Rights of Man. In 1794 he eagerly accepted President Washington's appointment of him as American minister to Holland to assist John Jay in negotiations with the British. He subsequently served as minister to Prussia from 1797 to 1801. As such he concluded a pact incorporating the neutral rights provisions of Jay’s Treaty. Home again in 1801, Adams served briefly in the Massachusetts Senate and then in the U.S. Senate from 1803 to 1808. Although a Federalist, he had no use for that party's increasingly regional posture and instead supported most of the policies of Thomas Jefferson's administration, including the Embargo Act of 1807. His refusal to bow to heavy pressure from the Massachusetts legislature to repudiate that measure led to his resignation from the Senate in 1808. President James Madison then appointed Adams minister to Russia. Here he did much to encourage Czar Alexander’s friendly feelings toward the United States. As chief American commissioner, he signed the Treaty of Ghent on Christmas Eve, 1814. Madison promptly appointed him the first postwar American minister to Britain. Like his father before him and his son, Charles Francis Adams, after him, he stood proudly before the king of the former mother country as the representative of his independent nation. As secretary of state during the administration of James Monroe, Adams took a leading role in its deliberations and earned his standing as perhaps the most successful secretary of state in American history. Increasingly bitter political strife puzzled and eventually infuriated Adams. He felt that he was entirely qualified indeed that it was his due to become president in 1825. His ambition triumphed. Although no candidate won a majority of the electoral vote in 1824, Adams accepted the support of Henry Clay to secure his final selection over Andrew Jackson and William H. Crawford by the House of Representatives. On March 4, 1825, he was inaugurated as a "minority president," and served one term. Adam’s presidency was marred by the incessant hostility of the combined Jackson and Crawford supporters in Congress. This prevented Adams from executing his envisaged nationalists program. His proposals for the creation of a department of the interior were rebuffed. Only after acrimonious debate did he obtain the appointment of delegates to a congress of the American nations in Panama in 1826. Committed to the idea of a protective tariff, Adams in 1828 was maneuvered into signing the grossly unfair Tariff of Abominations, thereby alienating the South, as his enemies hoped he would. He steadfastly refused to use the federal patronage to strengthen his party support, allowing his postmaster general to appoint Jackson backers. In the election 1828, pilloried as an aristocrat favoring special interests, Adams was overwhelmingly defeated by Jackson, (178 to 83 electoral votes). Thinking himself permanently retired to his books and to his farm, Adams, now a Whig responded dutifully when his neighbors elected him to the House of Representatives in 1830 and kept him there for nine consecutive terms. Adams was the only President to have ever been elected to serve as a congressman after his term as President was completed. There, as "Old Man Eloquent," Adams again and again spoke his conscience and called the nation to respond to its highest impulses. Adams dramatized for the nation the repressive character of slavery. Every year from 1836 to 1844 he led the fight to lift the gag rule that had ordered the tabling of all resolutions concerning slavery. He triumphed in 1844 when it was rescinded. When fatally stricken in the House in 1848, almost 70 years to the day after he had first sailed for Europe with his father, he had just voted against a resolution thanking the American generals of the Mexican War, a conflict he had opposed. John Quincy Adams suffered a stroke in the Speaker's room in Washington on February 21, 1848, while serving his last term as representative. He died two days later without regaining consciousness. His last words were: "This is the last of earth. I am content." When he died, he was not only the last surviving statesman of the American Revolution but also the first national leader to have dramatized the moral issue that precipitated the Civil War. Although he was at times rigid, demanding, self-righteous, and even quaint, John Quincy Adams possessed personal integrity, devotion to principle, intellectual intensity, and strong will.